‘Twelfth Night’ at the Young Vic. Photo: Johan Persson. From now on, I want all staged Shakespeare to be blockbuster length. 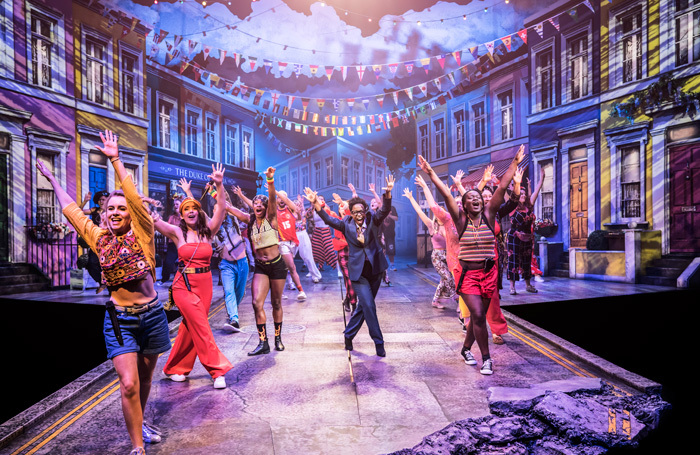 After seeing the Young Vic’s buoyant, charming Twelfth Night – the first show in Kwame Kwei-Armah and Despina Tsatsas’s tenure as artistic and executive directors – I honestly feel like you can pack pretty much all of the good stuff in in an hour and a half. This musical, which Kwei-Armah and co-director Oskar Eustis have restaged following its original production at The Public Theater in New York, is Shakespeare as party, as community event, with a huge local Southwark and Lambeth community chorus to match. I had some vague concerns about the Young Vic taking a show made in the U.S. for a U.S. audience, strapping in a community chorus and repackaging it as by and for London – but those dissolved in seconds. This is an irresistible, beguiling production, full of fun and joy, and a great antidote to the slightly medicinal feeling of strapping in for a three-hour Shakespeare that you can’t be bothered to watch, but know is good for you. Obviously I’m being facetious (mainly), but this Twelfth Night also functions as a fantastic reminder of everything that’s exciting and beautiful in the play itself. The production wears the original text lightly, but it doesn’t dispense with it – it’s full of warm welcome, inviting in audiences who might be unfamiliar with the play, while the songs are far more than set dressing. Shaina Taub’s lyrics (who co-conceived the show with Kwei-Armah) take the place of soliloquy, making visible, accessible, all the things that are most textually interesting in the play. When Viola (the fantastic Gabrielle Brooks) sings about the power she’s found in dressing as a man, pretending to be boy-servant Cesario, it feels electrifying: this is everything that was interesting 400 years ago when the play was written, everything about it that endures, writ large. The power to try out different selves, to free yourself from convention, to do the unexpected. Watching it, I remembered, in my early 20s, furiously Wikipedia-ing plot synopses before I saw any Shakespeare play I hadn’t read, and how going to the theatre sometimes felt like cribbing for an exam, and it made me so happy to think how far from that this show is – its demands on its audience are only that they give themselves over to its sense of fun. Twelfth Night is a narrative full of queer attraction, known and unknown, and the show celebrates that with gorgeous love song duets between Olivia and the cross-dressed Viola, between the Duke and the boy he thinks is his manservant – these are some of the best of the night. But being an early 17th century play, Twelfth Night also ends, inevitably, with a return to heterosexual order: the Duke can marry the boy once it turns out he’s really a woman; Olivia’s hopeless passion finds a home in Viola’s twin Sebastian – but what about Antonio? Motivated entirely by his love for, loyalty to Sebastian, Antonio is the play’s odd-lover-out. He is the only character whose queer infatuation can find no heteronormative resolution: the man he loves is really a man. Risking the bounty on his head to follow Sebastian to Illyria, Antonio ends the play imprisoned, abandoned, forgotten – and he often ends productions of the play as forgotten as he is by the text. Kwei-Armah and Eusis’s glittery, carnivalesque production manages to right this, sort of, through a moment in which, during the big full-cast finale, the Duke is seen to pardon Antonio – it’s a nice moment in what always feels to me like a slightly distressing ending. But there’s no textual reference to it, even in this show, light as it is on the text and constraints of the original. While they use this freedom marvellously and inventively throughout, it makes the slight textual forgetting of Antonio feel sadder, more like a missed opportunity, especially as at some moments it feels like his unrequited queer love is being played for laughs. Still, it feels churlish to focus on the ways in which the play didn’t hit every note when it hits so many. There is so much fun here: sumptuous vocal turns from Brooks and Melissa Allan’s happy-sad Feste, and a huge, knockabout, ludicrous Malvolio from Gerard Carey, who brings the house down in his big number. As a first show in the Young Vic, it feels like a huge and exciting statement of intent from Kwei-Armah and Tsatsas. London, get ready to be shown a good time. Twelfth Night is on at the Young Vic until 17th November. More info and tickets here.